The Fuzzy Five - #42: Ooh! Sugar-Free Caramel! Note: Sugar-free caramel, though wonderfully free of that sugary sugar stuff, is still extremely sticky. 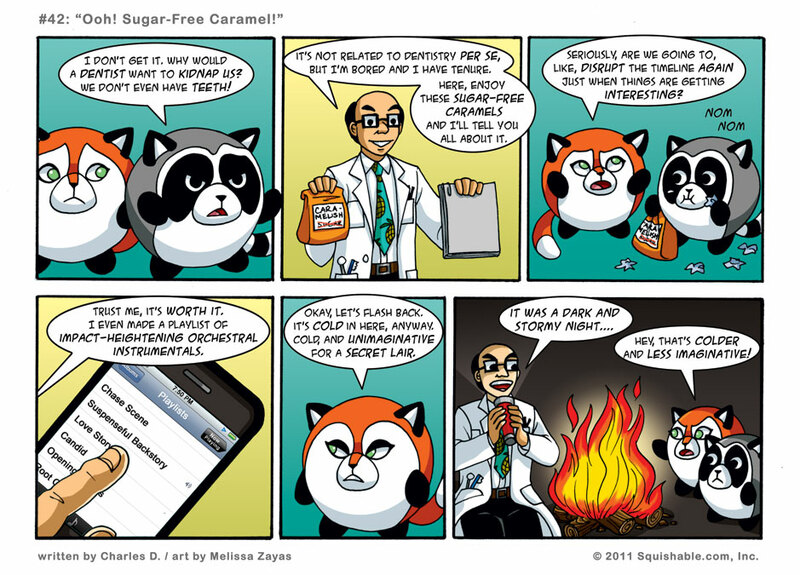 Use caution when eating sugar-free caramel. Sugar-free caramely goodness will still breed bacteria and cavities in the consumer’s teeth if not properly unstuck after use. P.S. We at the DAF do not necessarily espouse any of the ideas held by Dr. Liu of Ominous Mountain Dental, nor his love of sugar-free caramels. Nightshade must be hungry since they never got their waffles. Nom nom nom. What, no downloadable instrumentals to help US get through another flashback? I didn’t realize Squishables (even talking ones) could eat sugar free caramels. This raises all sorts of questions. Teehee at “Root Canal” on the list of playlists. Suspensful Backstory! Good eye, I hadn’t even caught that clever bit. there’s going to be a love story in there somewhere? can’t wait!